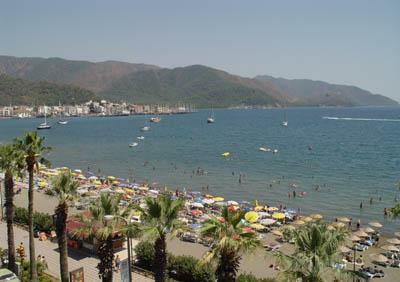 Located in the city centre of Marmaris, 90 km away from the Dalaman Airport. Outdoor restaurant * indoor restaurant * 2 bars * a’la carte restaurant (payable) * meeting hall * TV room * game room. 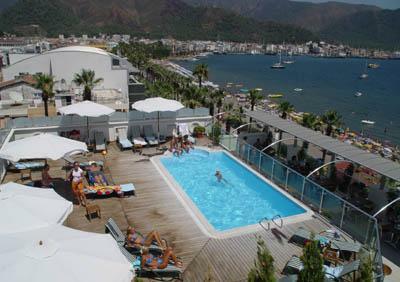 Outdoor swimming pool * indoor swimming pool * jacuzzi * sauna * Turkish bath * fitness centre. 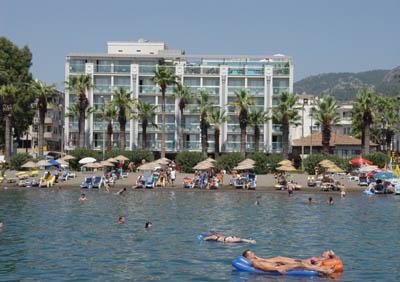 Safe box (at reception) * rent a car * massage * babysitter * water sports. Balcony * TV * split air condition * hairdryer * radio * room service * minibar * safe deposit box * telephone * shower/WC. 10 meters to the sandy beach. 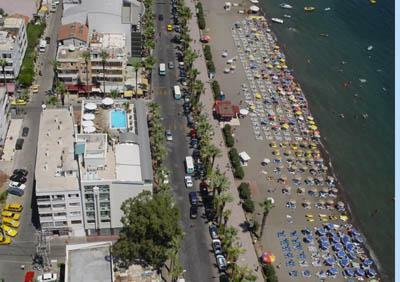 Length of the beach is 40 meters.